Our recent study in Nature Geoscience reconstructed conditions at the Antarctic coast during a warm period of Earth’s history. Today the Ross Sea has an ice shelf and the continent is ice covered; but we found the Antarctic coast was covered with tundra vegetation for some periods between 20 million and 15.5 million years ago. These findings are based on the isotopic composition of plant leaf waxes in marine sediments. That temperatures were warm at that time was not a huge surprise; surprising, was how much warmer things were – up to 11ºC (20ºF) warmer at the Antarctic coast! We expected to see polar amplification, i.e. greater changes towards the poles as the planet warms. This study found those coastal temperatures to be as warm as 7ºC or 45ºF during the summer months. 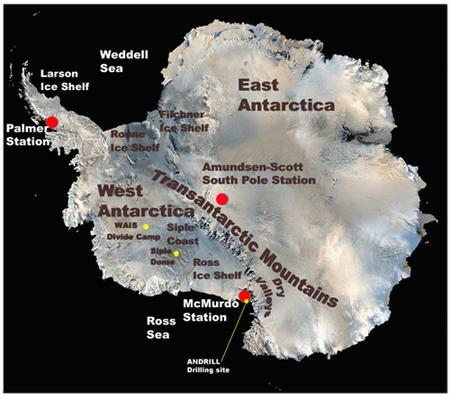 This is a surprise because conventional wisdom has tended to think of Antarctica being getting progressively colder since ice sheets first appeared on Antarctica 34 million years ago (but see Ruddiman (2010) for a good discussion of some of the puzzles). It’s been a tough few months for tree-rings, perhaps unfairly. Back in April, we commented on a study [that one of us (Mike) was involved in] that focused on the possibility that there is a threshold on the cooling recorded by tree-ring composites that could limit their ability to capture the short-term cooling signal associated with larger volcanic eruptions. Mostly lost in the discussion, however, was the fact–emphasized in the paper—that the trees appeared to be doing a remarkably good job in capturing the long-term temperature signal—the aspect of greatest relevance in discussions of climate change. This week there have been two additional studies published raising questions about the interpretation of tree-ring based climate reconstructions.